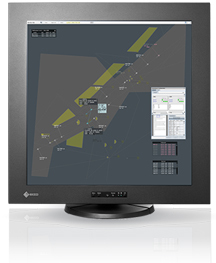 Wolfrathausen, Germany, December 10, 2013 – EUROCONTROL has again chosen the Raptor SQ2804 2K × 2K primary control monitor from EIZO at their Experimental Centre in Brétigny Sur Orge, France. The Raptor SQ2804 monitors have been installed in a series of simulation rooms to equip controller positions, where a number of real-time simulation platforms and tools dedicated to airspace validation are used. These include ESCAPE (EUROCONTROL Simulation Capability and Platform for Experimentation), eDEP (Early Demonstration and Evaluation Platform), and ECS (EUROCONTROL Cockpit Simulator). “We selected EIZO monitors because they were both financially competitive and went beyond fulfilling our technical requirements with regard to visual capability, reliability, as well as low energy consumption,” according to José Seixo from EUROCONTROL.